Born in 1957 in Pretoria, where I live and work. Studied at Pro Arte School and became a full-time artist in 1997. 1997 – Solo exhibition at Karen McKerron Gallery, Bryanston, Johannesburg. 1998 – Solo exhibition at Chelsea Gallery, Cape Town. 1999 – Solo exhibition at Karen McKerron Gallery, Bryanston, Johannesburg. 2001 – Two-month stay at the Cité Internationale des Arts, Paris. Group exhibition. 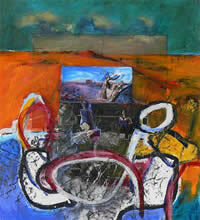 2001 – Solo exhibition at the Arts Association Pretoria. 2002-2003 – Studied Visual Arts at Unisa, Pretoria. 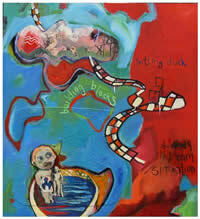 2003 – Joint exhibition at The Skukan Gallery, Pretoria. 2003 – Two-month stay at the Cité Internationale des Arts, Paris. Solo exhibition in the South African studio. 2006 – Solo exhibition at the Voir Gallery, Brooklyn, Pretoria. 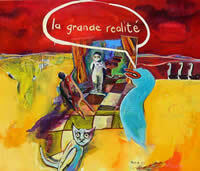 I like to combine landscapes and still-lives, with the main themes of Africa, the magical and the fantastic. Symbolism plays an important part in my paintings. There are recurring themes and images that hint at certain underlying values but that are left to the interpretation of the viewer. My work is represented in the Absa Bank and GTS corporate collections and in private collections in Belgium, England, France, Holland, Germany, South Africa and the U.S.A.